A huge reason that most of us are Disney fanatics (as opposed to say, theme park fanatics) is the level of customer service that the terrific cast members give us. The attention to detail, and ability to make someones day is one of the most important aspects of a Disney park. The lower level cast members are given a longer leash in their job descriptions if it involves creating a magical moment for a family. Last September we were trolling around Hollywood Studios late in the evening...we had gone for one reason only, to experience the new version of Star Tours. Make no mistake, this is a park we can live without almost entirely (TOT is a redeeming factor, as is PB&J milkshake...) but we do find it necessary to experience all new shows and attractions. So after a few rounds on Star Tours we were hustling toward the exit of the park, trying to beat the crowd that was about to swarm out of Fantasmic! At this point we realized that we're probably getting free funnel cake. The assumption was, of course, that they had MADE a funnel cake on accident and were merely trying to give it away so it wouldn't go to waste. Then Adam managed to sneak a peak inside...and realized that they were making an ENORMOUS funnel cake, a good three times the normal size! Keep in mind that the snack stand is still open for business, with a line several people deep who are themselves ordering late night funnel cakes! Sticking his head out the back door, the young man asks, "Do you guys like ice cream?" why yes we do! "how about whipped cream?" Why not! "Strawberries?" ummm.....no thanks. We hate to be picky when it comes to gigantic fried dough, but I honestly can't eat strawberries. Moments later we were presented the fantastic cloudy concoction, out the back door of the stand. We thanked the cast member with excited zeal....and asked him why he did that. "Because I love my job! and love working for Disney..."
the two cast members responsible! Look how big that thing is!!! 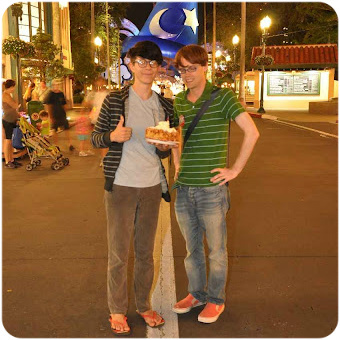 Just this trip I was walking into the Poly with my Aunt and Uncle. They had their anniversary buttons on - with 50th on them. The greeter at the door said congratulations and ask if they had any leis... They said no and she promptly TOOK OFF .... I was confused, I thought, the leis are just right there at the check in desk, where is she going? So, she comes back with REAL HAND MADE FLOWER leis!!! They were just beautiful. She then procees to lead my Aunt and Uncle through the ceremony of placing the leis on each other. It was such a special moment and truly a magical one! I forgot to mention. We weren't even staying at the Poly. We just came for dinner! Wow! That looks amazing! I keep telling myself that I'm going to try a funnel cake, but always forget. Hopefully I'll have one on my trip next month! Um, yum! Nom nom nom! This story epitomizes why Disney is the absolute best!